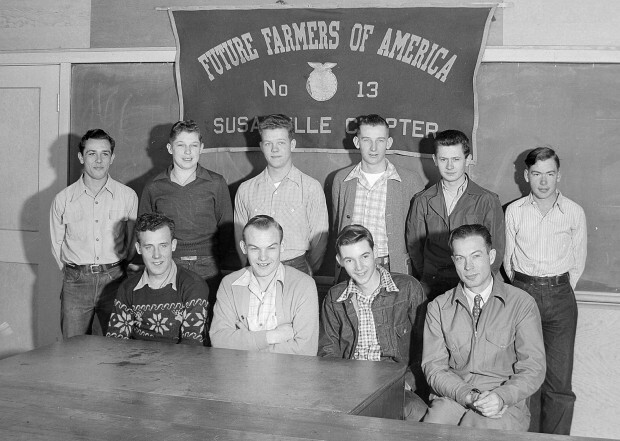 Susanville Chapter of the Future Farmers of America in 1948. Left to Right, seated: Don Gelmstedt, Bev Farwell, Stuart Robinson, Mr. Kinsey. Left to Right standing: Ray Boneck, Wallace Nye, Wilbur Stampfli, Jimmy Fraley, Lee Ragsdale, Ralph Fouse. Wallace Nye, senior FFA member, and Jim Fraley, junior member, will represent the Lassen county FFA chapter at the public speaking contest in Alturas on January 24. 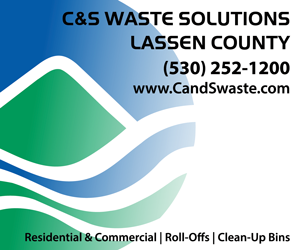 Subject of Nye’s talk is soil erosion and Fraley will speak on cooperative marketing. Participating in this contest will be representatives of FFA chapters in Tulelake, McArthur, Cedarville, Alturas and Susanville. 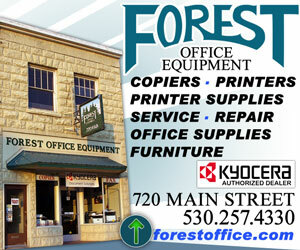 Winners of this contest will go to Redding for the regional meet. Winners of the six regions will compete in the state contest, and first place in the state FFA public speaking contest will receive $100 and second place $50. At the national convention, winners of each of the state contests will compete for top honors in the nation. The national convention is held in Kansas City each year in the fall school term. Last year Ed Zangger represented the local chapter and placed second in the California contest. Bev Lane seated in front. Carol Ragsdale-Bertrand oh my gosh your Dad . I was a few years behind these guys, but I knew all of them. Virginia Bob Middleton -recognize any of these faces? Carmen Rose Carrion Yes, all of them. Click on the picture and the names are under the photo. Can anyone fill in the names?